Check out the recently launched A Byte Out of Life, the new video series from Silicon Valley Moms Group (parent of Los Angeles Moms Blog, which I write for) and Yahoo. The first video tackles the issue of compulsive blogging. Are you addicted to your blog? And are your kids tired of you always being on the computer? I have to admit that CC came up to me once while I was on the computer, grabbed my hand and said, "C'mon." I felt duly chastised. Here, L.A. mom bloggers Kim Tracy Prince from House of Prince and Donna Schwartz Mills from SoCal Mom chat about blog obsession. New videos will be posted on Mondays. On Monday, CC and I got to swim in the same pool as silent film star Marion Davies and presumably her companion, newspaper mogul William Randolph Hearst. Yep, it's the one you see there, surrounded by gorgeously smooth black and white marble tiles. And for $1 each at that. 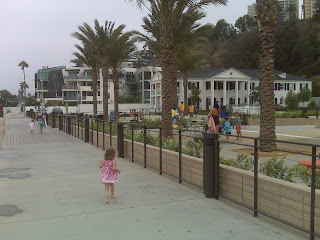 The Annenberg Community Beach House, aka the Santa Monica Beach House, sits right on the beach between the sand and the Pacific Coast Highway. Located on the former Marion Davies estate, the renovated complex includes a new beach house (where Davies' main house once stood), the pool, an adjacent play area and Davies' guest house, which is still standing and open for free tours daily. Not only that, but visitors can take advantage of Dollar Splash Mondays, which is how CC and I got to dip our toes into Old Hollywood glam for only a couple of bucks. Of course, you might have to wait your turn. 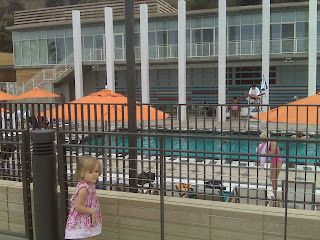 The pool quickly reaches capacity, and we had to wait an hour before we could get in. It wasn't really a problem, as the pool boasts an adjacent play area with fountains and toys (right), in addition to a sandy playground right on the beach. And once we got inside and leaped into the warm bath water of the heated pool -- after outfitting CC in a rent-free life jacket -- we swam, spun in circles and joined all the other parents and their kids in the shallow end. After our dip, we walked next door to the guest house, which is huge. The rooms are minimally furnished, but the light fixtures are original as well as the vivid bathroom tiles. The site has existed in many incarnations, including as a hotel, but the complex opened officially as a beach house in April. The L.A. Times has the story here. Vanity Fair features pics in its August issue. The Marion Davies Guest House sits next to the play area in the upper right corner. 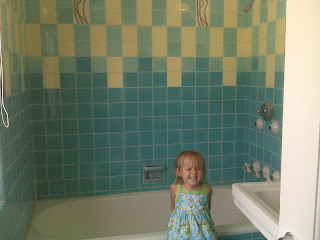 CC makes a colorful splash in the Marion Davies Guest House bathroom. What happens in Vegas apparently does not stay in Vegas ... at least when it comes to Cirque du Soleil. In honor of the company's 25th anniversary, troupes from the six resident alt-circus productions in Sin City are coming to L.A. to show off their elastic moves for free at The Grove on Sun., Aug. 2. Beginning at 12:30 p.m. and running throughout the day, sample performances from "The Beatles' LOVE," "Mystere," "O," "Zumanity," "KA" and "Criss Angel Believe" will try (and most certainly succeed) to distract wallet-gripping consumers from their guilty buyer's remorse. This only confirms what I've told Ian before about our child and Vegas: If she runs off to join the circus in Sin City, we only have ourselves to blame. CC and I cowboy'd up yesterday at the Autry Museum in Griffith Park for a little "Taste of the West." The museum, alongside Los Angeles Magazine, hosted a family-friendly day in the plaza that included complimentary Western-style grub and libations for adults and kids. That's in addition to gratis admission to the museum itself, which is home to fantastic exhibits Sparkle & Twang and Granite Frontiers. But more on those in a sec. When we arrived, I'll admit, we headed straight for the food -- mini BBQ sandwiches, cole slaw, oatmeal raisin apple bars, oh my! It was an eco-friendly event, so bamboo plates and recyclables were in order. Various stations around the plaza offered kid-friendly activities led by Leave No Trace, an organization that teaches people how to care for the great outdoors. CC was able to investigate a tent and find out what not to bring inside -- lantern (fire hazard) and food (hello, unwanted critters!). She also worked on a little puzzle, colored and basically just enjoyed cavorting around the wide open spaces of the museum grounds. Once we got inside and entered the fab Sparkle & Twang: Marty Stuart's American Musical Odyssey exhibit, running through Aug. 23, both CC and I were floored by the cool displays. Performance costumes from the likes of Dolly Parton, George Jones and Patsy Cline lined the walls. Letters, guitars and handwritten lyrics filled display boxes. And let's not forget the rock star dressing room and performance space, where visitors can don country fashion, grab a guitar and walk right up to a mic to sing in front of a tall wall of (2-D) screaming fans. I was waiting for CC to start belting out "Okie From Muskogee," but no such luck. The other exhibit on display is Granite Frontiers: A Century of Yosemite Climbing (running through Oct. 4), which features photography and films centered on rock-climbing. They even have mini-sized rocks with equipment that kids can grab, pull and clamp. Yes, mine tested that out vigorously. It was here that we met fellow L.A. mom blogger Dariela, who writes at Nuestra vida con Adrian, and her husband and son, Adrian. CC and Adrian investigated the exhibits, tugged on mountain-climbing gear, coiffed their hair in the Sparkle & Twang dressing room and basically just had a rockin' 2-year-old time. What's great about this museum is that it's so kid-friendly. Seriously. I mean, when I first heard about it years ago, I figured it was a staid relic of the cowboy past. (Yeah, feel kinda foolish admitting that to the world). But it's not at all. Not. At. All. I mean, what stuffy museum lets kids put on cowboy gear while crooning to Merle Haggard or invites children to pan for gold near a climb-able stagecoach or encourages tots to play restaurant hosts/waiters/cooks at an imagination-friendly restaurant replica? Kids are welcome any day of the week, at any exhibit, and we'll cowboy -- or cowgirl -- up for that any time. Check out my latest Los Angeles Moms Blog post: Love 3-D. The glasses -- not so much. As you might have read on this blog here and here, I love the idea of taking CC to 3-D movies. The problem is, she won't wear those pesky glasses. So what to do? Maybe you'll have some ideas. Baby Tasmanian Devil meet Hurricane Harbor. 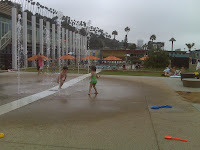 Yes, the hubs and I introduced our own little hurricane to the splashiest water park in the L.A. area -- located in the scorched Valencia desert. And talk about a freaking hot day. I could feel my skin begging for mercy as we walked from the vast parking lot to the park's gated entry. And this was at 11:30 in the morning! But once we got our swimsuits adjusted, life jackets on -- well, just one -- and inner tube secured, CC hit the ground running as if she were an old Hurricane Harbor pro. Kid did not even know the meaning of first timer. We didn't take her on crazy rides like Black Snake Summit, which shoot you down an inches-wide open tube like a wet ball of fury -- I figure you have to be at least 3 for those. (Kidding, Water Safety Police!) We basically stayed in the two kiddie areas, tried out the wave pool and lolled around in the Lazy River. It was so nice. Feeling the splash of the cold water, the current of the winding river and watching as CC charged fearlessly up ladders, down baby water slides and through soaring currents of liquid. The child seriously has no fear -- and that terrifies me. At one point, as we were walking through a plastic rain forest of shooting water in a 1-foot-deep pool, CC fell down. It was like in the movies when the sound slows waaaaay down. So when I yelled her name, it was as if some super-low-voiced monster was calling out for my baby. And that monster was me. This barbaric yawp came as I pushed casual frolickers out of the way to get to my downed offspring. Of course this happened in all of about two seconds, and she was already up by the time I reached for her arm, but, hey, who said heart attacks weren't good for getting the blood pumping? Luckily, we capped off the day -- around 5 p.m. -- at the smaller of the two kiddie areas. Ian let me lounge in the sun while he and CC went up and down the baby water slides over and over and over again. In the end, it was the two of us who were exhausted. Had we let her, CC would've stayed until they turned off the lights -- or drained all the water. That is, until we got to the car. Then it was snooze city. Can I have this dance, Blogger Prom? Last night at Blogger Prom, we partied like it was 1989. Hosted on the rooftop of the Andaz Hotel on the Sunset Strip, bloggers from all over L.A. were in attendance at the first event of its kind, where the dress code was cheesy prom attire. Emphasis on the cheese. I had a great time, all decked out in a sea foam blue-green dress I picked up at Goodwill for a mere $3.99 and (un)matching gold shoes for a little pricier $5.99. It was all in good fun, as we dined on sponsored eats from RH and Polkatots Cupcakes and imbibed courtesy booze from the likes of Pinky Vodka and Martin Miller's Gin. And the night's goody bag might be deserving of its own star on the Hollywood Walk of Fame. It was that good. Thank you to the fab Blogger Prom 2009 Committee: Caroline from Caroline on Crack, Marni from Happy Go Marni, Esther from e*starLA, Tara from When Tara Met Blog, Lindsay from LAist, Maya from Shop Eat Sleep, Natalie from The Liquid Muse and H.C. from L.A. and O.C. Foodventures. Guinea pigs are invading Hollywood, and CC couldn't be happier. 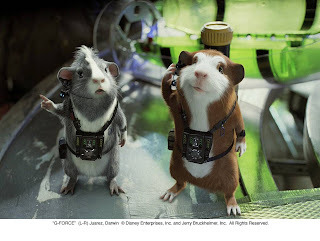 In fact, every time we've passed the poster for the Walt Disney Pictures and Jerry Bruckheimer 3-D movie "G-Force," CC has pointed and shouted "Pig!" Apparently, she's not down with the "guinea." "G-Force" opens July 24, and the El Capitan Theater is hosting not only the movie but also the "Experience." After the movie -- which is about a covert FBI team of, what else, guinea pigs -- audiences can head across the street to engage in activities, which include plotting a spy map, crushing digital bugs and deciphering a secret code. They can also see real props and sets from the movie and go behind the scenes with an art exhibit. This is all included in the price of admission, which admittedly is not cheap ($20 for adults -- $18 for a matinee -- and $15 for kids ages 3-11). But, the El Cap is certainly closer than Disneyland, and if you're looking for a summer splurge that includes air-conditioning, this could be an option. I know CC would love to give new meaning to the phrase "pigging out." Yes, I've been stalking the Coolhaus truck. And I'm not ashamed. If you haven't heard of the pun-friendly, peripatetic ice-cream truck, it's the latest summer craze to hit L.A.
Their "sammies," as they call the sandwiches, boast architecture-inspired monikers, such as Frank Behry (sugar cookie and strawberry ice cream) -- which, by the way, is what CC and I ordered -- and Mintimalism (chocolate cookie and mint chip ice cream). Even the name of their company is a rif on good ol' Rem (as in Koolhaas). When CC and I were ordering our Frank Behry ($3), I chatted with Natasha about kids' parties, and she said they have catered several. 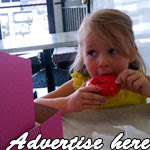 The edible wrappers can even be custom designed to include a child's picture and message. And, she emphasized, they have no sugar in them, which parents love. It's just wafer paper. Even better. Can't say CC knew what to make of one of the wrappers on its own, but she sure didn't mind biting into it when it became part of the sandwich itself. Sorry, I don't have a pic of the actual sammie. We inhaled that handful of Behry goodness before you could say Mies Vanilla Rohe. Who says art can't be fun AND made of plastic? I'm sure that's exactly what Korean artist Choi Jeong-Hwa said to himself before creating this colorful and virtually unbreakable exhibit "HappyHappy," commissioned by the Los Angeles County Museum of Art and on display in the LACMA plaza. And which, according to the L.A. Times, was all bought from a local 99 Cents Only store. You can imagine how difficult it was to retrieve my child from this playful creation. CC raced in between and around the hanging lines of plastic baskets, funnels and bowls, actually trying to lose me a couple times amid the maze of unused dinnerware. "HappyHappy" is one of several pieces of art that make up Your Bright Future: 12 Contemporary Artists From Korea, running through Sept. 20 at the museum. Those driving down Wilshire Boulevard can't miss Choi's other project, "Welcome," which has the Ahmanson Building wrapped in swaths of colorful ribbons (right). And don't forget about LACMA's NexGen program, which offers free general admission to anyone 17 and under as well as one accompanying adult. Hello, free art! Credit cards have nothing on this colorful and gratis plastic. We celebrated the L.A. Farmers Market's 75th anniversary today by heading over to 3rd and Fairfax to take in the festivities and nose around for any leftover cake. We missed the official birthday ceremony this morning at 8 a.m., which was hosted by comedian Jeff Garlin and included the USC marching band and clock tower cake presentatio n. But we did make it for the Nickelodeon Barbershop Quartet, who strolled through the market as we ate our chicken tacos. We also got to experience Gwendolyn and the Good Time Gang, who were performing for the weekly Kids Club event at the Grove. And we even bumped into fellow LA Moms Blog contributor Kim from House of Prince. CC got to dance some more and walked right up to the stage to get a little closer to other kiddies and the Gang. This time, however, I put her in a dress so as to avoid any, ahem, wardrobe malfunctions. The 75th anniversary celebrations continue through Sunday, July 19. CC and Paddy's Pig at the L.A. Zoo from LA Story on Vimeo. CC danced her version of an Irish jig before hitting the Polynesian party at the Los Angeles Zoo's World Music Night on Tuesday. I'm so happy I got video of her dancing. You can't beat a hip-shaking toddler with no fear of YouTube. If anyone reading this was there, yes, that was me rushing down the aisle to pull up my child's pants and rush her out of the crowded scene faster than you can say Paddy or pig. Fortunately or unfortunately -- I haven't decided yet -- I didn't capture the de-pantsing for posterity. I'm convinced I would've won some sort of America's Funniest Home Videos award, if that show is even still on. In the meantime, I'm sure Music in the Zoo will never be the same. I know I won't be. After we had some dinner at one of the internationally themed food stations around the zoo, we joined a fellow mom (Hi Janice from MeetUp.com's Studio City mom's group!) and her 20-month-old daughter for some Polynesian dancing, courtesy of Island Inspirations. Not only did we get music made famous by the likes of Don Ho ("Tiny Bubbles") and Israel Kamakawiwo'ole, aka Iz ("Somewhere Over the Rainbow"), the lovely ladies even invited the kiddies -- or Keiki, as they're called in Hawaii -- to show off their own moves. CC bolted for the little wooden gate that had since been separating her from hula greatness. But come to think of it, as I'm watching the below video for a second time, I think I see my child about to go trou-dropping again. The first time I watched this, I wasn't really paying attention to what the lead dancer was saying as she taught zoo visitors how to shake their groove thang. What she's saying is, "Take it (or shake it) all the way down!" Have a look at what that means to my daughter. I can only hope she resisted in the end to spare her mom a second humiliation. CC dances Tahitian style at L.A. Zoo from LA Story on Vimeo. Yes, my child is in there somewhere. I promise. Granted, she tried to lose me several times, but CC is definitely in there. On Saturday, we drove down to Manhattan Beach for an open house at AdventurePlex -- a children's indoor/outdoor wonderland if there ever was one. I was almost waiting for Willy Wonka to pop out and offer the kids an endless supply of guilt-free sweets because it was that kind of kid-friendly experience. There wasn't a fountain of chocolate, but there were $1 hot dogs. And, yeah, we doubled down on those. So I handed over $5 (under 3 years old), which covered two hours of free play in that mammoth structure you see above, plus a 1/2 hour session of AdventureTots. When we arrived for the class in AdventurePlex's multipurpose room, CC didn't hesitate to start crawling through the collapsible tunnels, rolling around a few huge bouncy balls and basically just running free with the other tots. I have to say, it's totally absorbing to watch your child in these situations, because you get to really see just how athletic or agile they really are. And I have to admit, my daughter is no slouch. During the open house, the AdventureTots instructor was available, but it was more of a Q&A opportunity than an actual class. So we didn't get to experience what it would be like for CC to focus on movement, listening skills and games -- which is what the class offers. Instead it was more of a free play. And the more I saw CC wanting to jump and run and chase babies who were just learning to walk, I decided the indoor chutes and ladders (rightly named the Adventure Room) was more up her energetic alley. And, man, did she play. And play. And play. At one point, I looked up -- literally craning my neck -- and thought, "What if I have to go up there and get her?" (Luckily, parents can crawl in there, too.) My other thought was, "She's rocking out, like, two stories above me. And she loves it!" It took a little coaxing, but after some serious playtime, she did make her way down to the main floor, where her mother stood eyeballing every slide down the slide, every step down the stairs and every (quick) step through the indoor romper room. And, let me tell you, nap time was a cinch. What's your L.A. Story, Debi Derryberry? 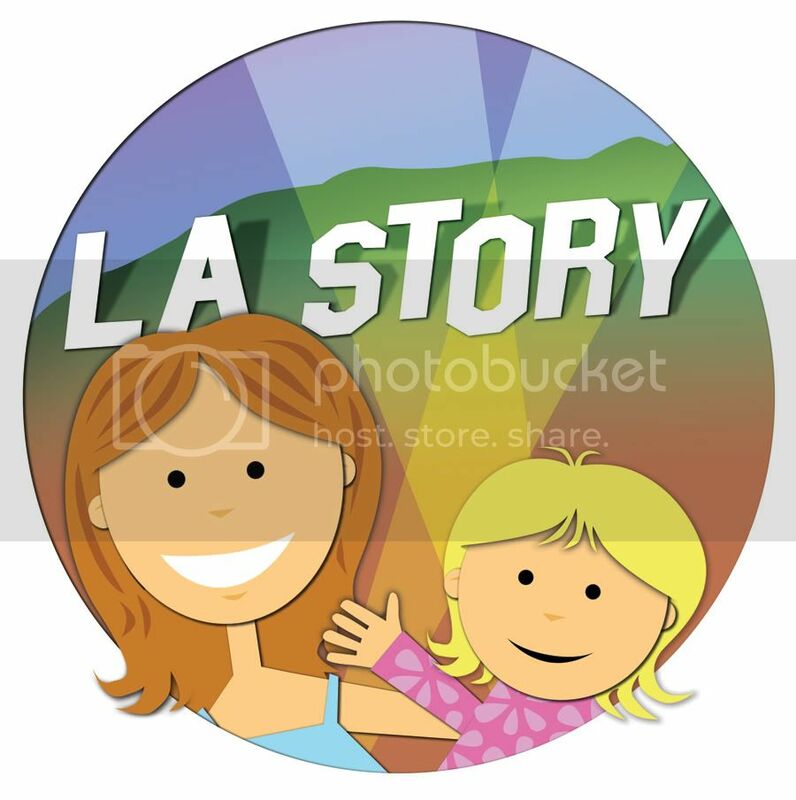 What's your L.A. Story, Debi Derryberry? from LA Story on Vimeo. What's your L.A. Story, Debi Derryberry? Part II from LA Story on Vimeo. If you're a parent -- and maybe even if you're not -- you've probably heard Debi Derryberry's voice in your home a million times. And not in a stalker kind of way. She's the talent behind "Jimmy Neutron: Boy Genius" himself, as well as characters on "Oswald" and "Curious George." But the voice talent and singer/songwriter is also mom to 8-year-old son River and has recently launched her newest children's CD, "Baby Banana." Debi talks road trips, museums, piano lessons and the trio of chickens she shares with son River and her art consultant husband, Harvey Jordan, in the latest installment of "What's your L.A. Story?" Thanks again, Debi! Had a great time chatting with you! Check out the joint Los Angeles Moms Blog and Silicon Valley Moms Blog post about our recent chat with PBS KIDS and the creator of tot show "Super Why!" It's interesting to see how each of the moms responded to the event and how their kids got involved with the at-home "tool kit." CC learned a lot during that 5-day process. I was truly amazed and wrote about it here. She still asks to hear the "Alpha Pig song," aka the Alphabet. The magic words at last night's Ringling Bros. and Barnum & Bailey circus opener weren't the usual hocus-pocus. There wasn't even an abracadabra in shouting distance. It was Zing, Zang, Zoom all the way, and, man, did it captivate my daughter. And yes, me too. I haven't been to the circus in *cough* decades *cough*, and have since become a little jaded. (Or maybe that's just because I watched HBO's Carnivale.) So I was eager to see what CC would think of her first trip to that traveling childhood attraction. But once we got to our seats, and the lights came up, she was dazzled. Nonstop. But, seriously, how can you argue with ponies and zebras and elephants and clowns, and more elephants (CC loved them!) and the newest addition to the circus: Magic. As I wrote in an earlier post, Ringling Bros. has re-imagined the circus this time out to include some sleight of hand on a massive 360-degree scale. Alex Ramon, our energetic 24-year-old Zingmaster, oversaw such tricks as making an elephant disappear and turning the night's pseudo-villain Mr. Gravity, into a tiger. Acrobats twisted, swung and flipped from all sorts of moving objects, and a couple of daring artists balanced on spinning wheels, which seemed to be a mile above the audience. When two women were shot out of twin canons across the stadium, I thought my heart would stop. After intermission, I noticed that nets had gone up all around the floor's perimeter and a mechanical device descended from the rafters revealing a circular chain-link fence. This was actually the first time I had felt any sense of real terror at an animal show. Maybe it's because we're living in a post-Sigfried & Roy world. I mean, when did I think a tiger could really maul you in the safety of an urban convention center, much less the intoxicated Sin City? Don't they go out for drinks after the show, too? But this time, with my 2-year-old in tow, I was kinda digging on all the safety precautions. The show concluded with another parade of CC's fave elephants, and it was a little hard to leave. The circus hasn't connected with me in a long time, and I was happy that it didn't disappoint. "Did you have fun tonight?" I asked CC on the way out. "YEAH!!!" she yelled, eyes gleaming. And with her head resting on my shoulder, looking back at the dark floor that was shutting down for the night, she said, "Bye-bye, Circus." A four-pack of tickets are $44 when you enter the code "MOM" on Ticketmaster.com or when you purchase tickets at arena box offices. * The code must be entered in the "MC Promotion Box," and you must purchase at least four tickets for the price to be valid. Each additional ticket purchased is still priced at $11. * Not valid on circus celebrity, front row or VIP seats, and facility fees still apply. The Japanese American National Museum in Little Tokyo will be hosting a free family day on Saturday, July 11, thanks to the support of Target. This month's focus is on books, so not only can kids create their own notebook, bookmark and origami tome, they can also listen to master storyteller Rodney Kageyama read Allen Say's "Under the Cherry Blossom Tree." If kids want to tell their own stories, they can also create their own kamishibai -- a form of storytelling that originated in Japanese Buddhist temples in the 12th century. So say "Konichiwa" to this downtown museum if you haven't already stopped by. After all, you can't beat the price. 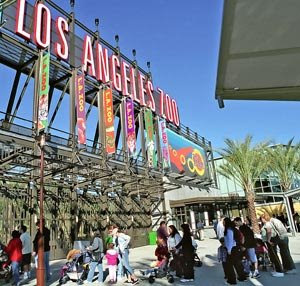 The Los Angeles Zoo will be rocking out twice this month, with World Music Night and Classic Rock Night headlining Music in the L.A. Zoo. The first installment, World Music Night, kicks off at 6 p.m. after the gates close on Tuesday, July 14, and will play host to an international medley of musicians. Polynesian, African, Irish and Latin bands will tune up under the stars, while zoo-goers can picnic or partake of the available Hawaiian Luau among the park's permanent residents. Classic Rock Night takes the stage Friday, July 24, and will feature cover bands of music by The Beatles, The Grateful Dead and Bob Dylan, among others. Look for good ol' American BBQ to be served that night. Both World Music Night and Classic Rock Night will also include 10 interactive animal education and conservation stations located throughout the zoo, staffed by zoo docents as well as 60 mom-and-daughter volunteers from the Glendale chapter of the National Charity League. World Music Night focuses on international animals, while Classic Rock Night focuses on animals native to California. Look forward to seeing what the zoo inhabitants are like after hours and which animal-monikered band they prefer -- Paddy's Pig from Ireland or the music of the all-American Eagles? I have to give a special shout-out to Ian's mom, who gave us a zoo family pass while she was in town. Thank you, N! World Music Night: July 14, 6-9 p.m.
Classic Rock Night: July 24, 6-9 p.m. There's a certain irony in the fact that CC's and my planned trip to the Staples Center today for a circus-related event was postponed. Today Los Angeles is mourning the death of pop legend Michael Jackson, who passed away here June 25. The Staples Center is hosting the memorial service, which has been the subject of so much talk and general hysteria for the past week. First there was the confusion about where the service would be. Then there was the heated fury of trying to get tickets in an online lottery. Next there was the announcement of the lucky 17,000 who could attend, and then the terror of navigating Tuesday traffic downtown -- if you were allowed down there at all. I will always remember Michael Jackson from 1983, when I was in third grade and, along with my friend Alana, was totally enamored of his music. I owned his record (yes, record) "Thriller," listened to it religiously and even had the misfortune of trying to moonwalk. He was talented, fun, adventurous and had effing amazing songs you could rock out to. He was "It," and what he had was magical and infectious. What happened to Michael Jackson between that golden year (for me) of 1983 and 2009 is a mystery for so many. And I don't think I'll ever wrap my head around it. I didn't write about his death on June 25 because everything about it seemed to be a, well, circus. And that's too bad. It wasn't the kind of circus I wanted CC to remember. When another music "King" Elvis Presley died in 1977, I was 2 1/2 -- CC's age. What I know of Elvis is based purely on the breathless memories of others. Forget his downward spiral. Forget the drugs. He was the King. 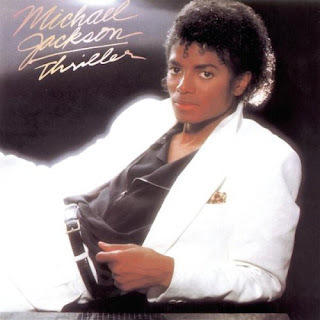 So, CC, when you're older and discover the truly awesome music of Michael Jackson, I hope you appreciate the good stuff and rock out like your mom did. Death by chocolate? OK, so maybe not death -- but something along the lines of diabetic coma is what happened after baking semi-homemade Sprinkles Cupcakes on the Fourth of July. Instead of making that ubiquitous flag cake with the red and blue berries, I decided that CC and I would spend some mother-daughter time baking cupcakes. My friend Laura had given me a sleek canister of the Sprinkles mix a while ago, and it was time to grab all the necessary ingredients to make the dark-chocolate goodness a flag-waving reality. The canister ($14) consists of the cupcake mix, the signature modern dots, instructions and a recipe for frosting. And it's work, lemme tell ya. So not only do you get the cachet of making "Sprinkles" cupcakes, but you also put enough of your own energy into it to safely call them something very close to your own. So after getting the milk, unsalted butter, huge bar of bittersweet chocolate to later melt, eggs, vanilla, powdered sugar and huge dose of stamina to psych myself up, I called my 2-year-old into the kitchen to add that extra je ne sais quois to the recipe. Yes, there was spilled milk. There was also chocolate batter smeared all over my child's face and clothing (the bib went on a little too late). Throw in a little yelling and chasing. Not to mention chocolate-smuggling by a certain pint-sized bandit. (That kid is fast!) And you get a recipe for one of the most natural of disasters -- me in the kitchen with a toddler. In the end, we created 12 amazingly delicious, chocolate-y -- probably the richest I've ever tasted, and Ian agrees -- bundles of sweet Sprinkles joy. Which is better than a flag cake any day, even on the Fourth of July. Sony Pictures Animation has just released its second -- and I think better -- trailer for its first 3-D animated movie "Cloudy With a Chance of Meatballs." The movie, which boasts a voice cast including Bill Hader, Anna Faris, Andy Samberg and -- wait for it -- Mr T. (! ), opens in theaters Sept. 18. The story, based on the children's book by Judi Barrett and Ron Barrett, revolves around a town so down on its luck that its residents have to eat sardines. And because sardines are "super gross" (and super cheap, too, I'm guessing), a kooky inventor figures out a way to make cheeseburgers and pancakes fall from the sky like rain. Mmm, pancakes. But flying ginormous food turns out to be another problem in and of itself. Wonder if Sony can compete with the likes of Disney/Pixar and DreamWorks Animation in the 3-D department. We'll see. In the meantime, while you wait for September to roll around, Sony has created an online game where you can have a food fight with Steve the Monkey (voiced in the movie by the awesome Neil Patrick Harris). This could get addictive. After all, who doesn't enjoy throwing cherry pie and whipped cream at a monkey? Hope everyone has a happy and safe 4th of July! As I posted before, the Los Angeles Memorial Coliseum is firing off the huge sparklers for free tonight, but here's a link, courtesy of the Los Angeles Times, to a list of other events around Southern California. I always used to think of hot pastrami as liquid meat. You know, something red and tangy that you'd pour onto a potent slice of rye bread. In other words, I'd never had it. So when my friend Mike from Franklin Avenue invited me to join his fam and Variety pal Justin for lunch at Langer's, I was intrigued but nervous. My taste buds, although adventurous, are known to have a mind of their own. So yesterday, I brought CC along for the ride and had my first hot pastrami with cheese on rye at the deli nestled on Alvarado Street just south of the infamous MacArthur Park. I have to say: It was amazing. I'm talking Meg Ryan in "When Harry Met Sally" deli scene amazing. That's what the pastrami sandwich on perfectly crisp rye bread brought out in me. And I might have reacted in the same orgasmic fashion had I not had an over-hyped toddler on my hands who rivaled Curious George in the mischief department. Admittedly, I had to wake her from her nap so we could head out on our pastrami adventure, and she's always hyperactive if she doesn't get all of her zzz's, but this was insane. CC kept leaping on Mike's patient -- and very pregnant -- wife as well as on his adorable son, aka "Blogger Preschooler." She even tried to literally climb the walls -- the trellis-like wooden dividers behind our back corner booth -- before I tugged on her hips and pried her little toddler hands from the furniture. Justin was game, as always, having experienced CC excitement before. And Mike and his family were completely gracious, although Blogger Preschooler looked eager to make a run for it. And after we stuffed ourselves, I brought CC home, and she collapsed on the bed, perfectly willing to resume the sweet slumber I'd selfishly interrupted. I, on the other hand, was ready for a cocktail. What's your L.A. Story, Tina Thompson? I had the opportunity this week to chat with WNBA basketball player and mom Tina Thompson, who this year kicked off her first season with the Los Angeles Sparks. Despite being a native Angeleno -- having played hoops for Morningside High School and USC -- Tina began her professional career with the Houston Comets, where she played for 12 years. Now she's back in town and making life in the city work as a pro basketball player with a 4-year-old son. Tina talks about traveling, balancing work and motherhood, family and how she's eager for her little boy to become a California kid. Before I chatted with Tina, I got the chance to watch the L.A. Sparks trounce the Seattle Storm at the Staples Center on Sunday. My friend Kathy, who blogs at Variety's Season Pass, CC and I enjoyed the lively but laid-back atmosphere, which included dance numbers, hoops contests and sports celeb sightings -- Hello L.A. Dodgers' Matt Kemp and L.A. Lakers' Trevor Ariza! The season runs through September, so we'll definitely have to go again. To make it a little easier on the wallet, the WNBA has generously offered a 15% off discount code for readers who want to catch a Sparks home game. Thank so much, Tina! And good luck with the rest of the season! 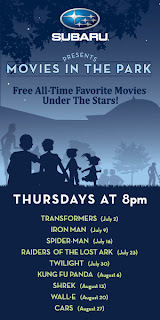 If you missed movies like the original Transformers, Iron Man, Shrek or Wall-E in the theater -- or just wanted to relive the magic in the great outdoors -- you can bring a blanket (sorry, no chairs allowed) to The Grove on Thursdays for free alfresco movie night. Beginning tomorrow at 8 p.m. with Michael Bay's Transformers, the outdoor mall kicks off its summer family-friendly film series, which runs through Aug. 27. Bring your own grub or pre-order gourmet picnics from any of the restaurants at The Grove. 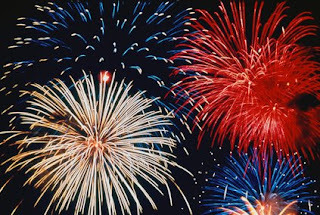 July 4 is this Saturday, and there are tons of events around town to celebrate the occasion. One free event is the fireworks display at the Los Angeles Memorial Coliseum in Exposition Park. Keep in mind that although the event is gratis, parking most certainly will not be. There are plenty of lots around Expo Park, however, including a structure at 39th and Fig.